The Treefrog family tree is extensive, with many contributions over the years! 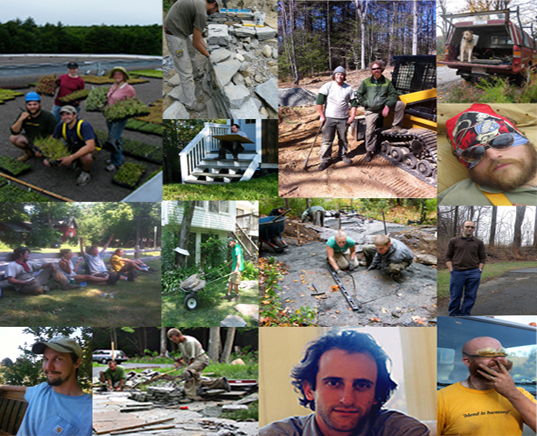 We are plant people, horticulturalists, gardeners, permaculture designers, landscape architect students, stone masons, ecologists and builders. In any given season we are a crew of up to 10. We believe that staying relatively small is the best way to build with integrity and maintain balance. Treefrog prides ourselves on our designers doing the building. In any given project, the team our client meets with on the initial consultation is the team that works with the client through the design and the build process. This produces a far superior product than the segmented process of a designer sub contracting contractors. It also gives the client certain securities along the way. There is no question of accountability or who our client is going to engage. This integrated process also requires a staff member capable of engaging in a multitude of skill sets. There is a depth and breath to each employee’s experience in the field. And a willingness to build their skill set. This eagerness to learn and tackle a challenge is essential to our core mission of pushing the edge of what is available in the landscape field. Perhaps most importantly, we work as a team in rhythm.